Hey, move over!, originally uploaded by silent explorer 13. God, I’m a sucker for baby squirrels in a treehole. Two Baby Squirrels, originally uploaded by crazysanman. 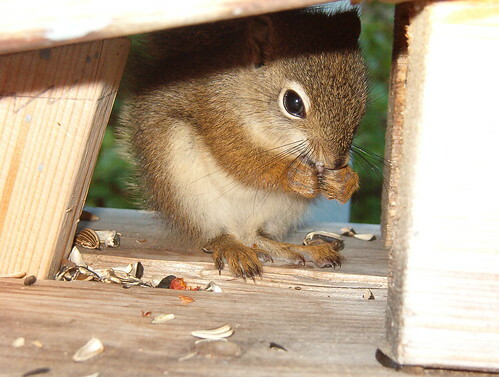 “Spring is just a few weeks away and squirrels have already built their nests and are having their young. It is also a time when many of us trim trees and branches. 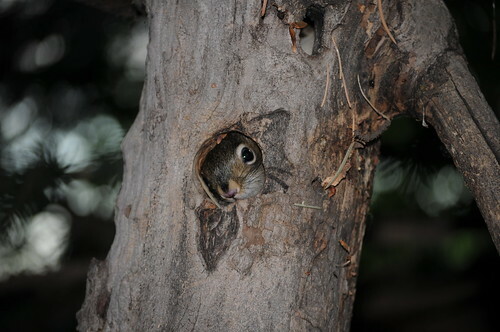 The article also has good tips on how to build an artificial squirrel nest, and what to do if you do accidentally knock a squirrel nest out of a tree. Red Squirrel, originally uploaded by I-P-S.
Squirrel Stories: SQUIRREL IN DA HOLE! Baby Squirrel, originally uploaded by K. Rattray. Cute photo, huh? Thanks K. Rattray! “When I worked [exact location redacted] with my friend Rachel, we used to send many emails back and forth during the day tracking the progress of the squirrels that lived in the building across the street. We sent emails with the subject “SQUIRREL IN DA HOLE!” to let the other one know when one was popping its head out of the little hole in the roof that was used as their homebase.